Windows 10 October 2018 Update is just around the corner and it comes with a bunch of exciting features that you can find here. One of the best features is the Smart Upgrade that uses artificial intelligence to improve the quality and reliability of the Windows Updates. Microsoft has always been criticized for upgrading the consumers PC at the wrong time but the software giant recently figured out a solution to deal with this problem. In release notes of Windows 10 Build 18204 that was released earlier this year, Microsoft revealed that they’ve updated the reboot logic to use a new system that is more adaptive and proactive. Microsoft is using AI tech to improve the quality and reliability of the Windows Update feature. 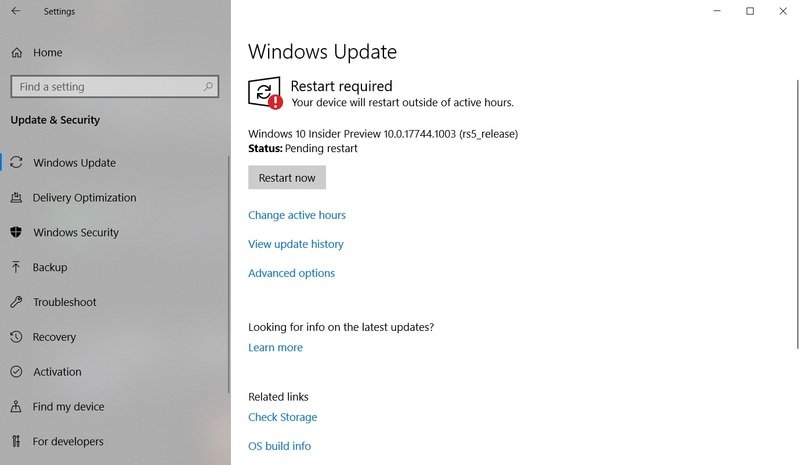 Microsoft has trained Windows 10 to accurately predict the right time that is to restart the device. For example, Microsoft won’t upgrade your PC if you left it for a couple of minutes or half an hour to grab a cup of coffee. The model that Microsoft has trained works fine according to the company’s internal testing. In internal testing, Microsoft managed to upgrade the devices with minimal turnaround times, thanks to the company’s cloud infrastructure. The Smart Upgrade feature is powered by AI so it would analyze data on the characteristics of devices – presumably in terms of usage – to find out the correct time to upgrade your PC. A new report suggests that the feature is missing in the latest preview build of the October 2018 Update (that is Build 17763). A Microsoft representative said that it has “nothing to share” about the feature at the moment. It’s not a good news but as Microsoft is yet to finalize the RTM candidate, there’s still a chance that the feature will appear in the imminent final version of the Windows 10 October 2018 Update. For those unfamiliar, Microsoft is expected to launch Windows 10 October 2018 Update next month and the rumour has it that the RTM candidate will be signed off on September 25.